PSO violinists Sarah Clendenning and Eva Burmeister play for a family attending Music Around the World Day at Children’s Hospital of Pittsburgh of UPMC in September 2015. “The dignity with which the musicians played caused me to feel honored, humble, and grateful, and it brought tears to my eyes. Over the years, participants have enthusiastically shared many comments expressing appreciation for the Music and Wellness Program, which utilizes the expertise of Pittsburgh Symphony Orchestra (PSO) musicians and staff to serve as a resource empowering individuals and communities to use music for the promotion of health and wellness. Through the Music and Wellness Program, the PSO works with music therapists and other healthcare professionals to bring therapeutic, live music to the Children’s Hospital of Pittsburgh of UPMC, the VA Pittsburgh Healthcare System’s H. J. Heinz Campus, and other facilities in the Pittsburgh area and abroad. 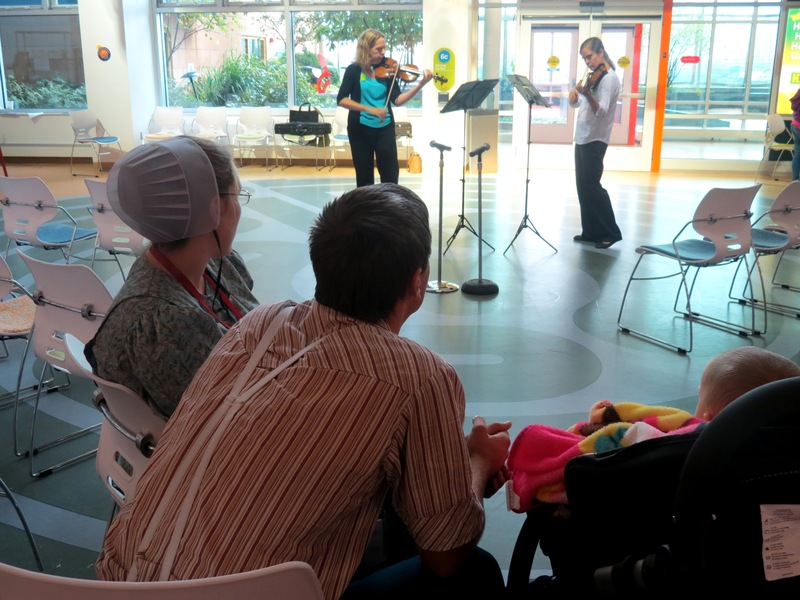 PSO musicians lead music and wellness sessions for small yet diverse groups of participants that include patients, their families, and healthcare staff. By interacting with participants and performing relevant and meaningful music, musicians help participants address their physical, emotional, and social needs, as illustrated by a story Principal Flute Lorna McGhee shared about a visit to a cognitive therapy group. The PSO also supports musicians, arts organizations, and healthcare facilities with resources like its free handbook for those designing, implementing, and evaluating music and wellness programs. Through the Musical Living blog and collaborations with local yoga instructors, the symphony helps people use music to live healthier lifestyles as well. Since the PSO began the Music and Wellness Program in 1999, organizations like the Highmark Foundation, Michael Baker Corporation, Fine Foundation, Ann and Gordon Getty Foundation and League of American Orchestras, Scaife Family Foundation, and FedEx Ground have believed and invested in the program’s vision of being a nationally-recognized model for improving the well-being of individuals and communities through music. Healthcare providers in the Pittsburgh area have increasingly requested to collaborate with the PSO to bring music to their facilities, and other orchestras have looked to the PSO’s program as a model and sought assistance from PSO musicians and staff when developing their own programs.